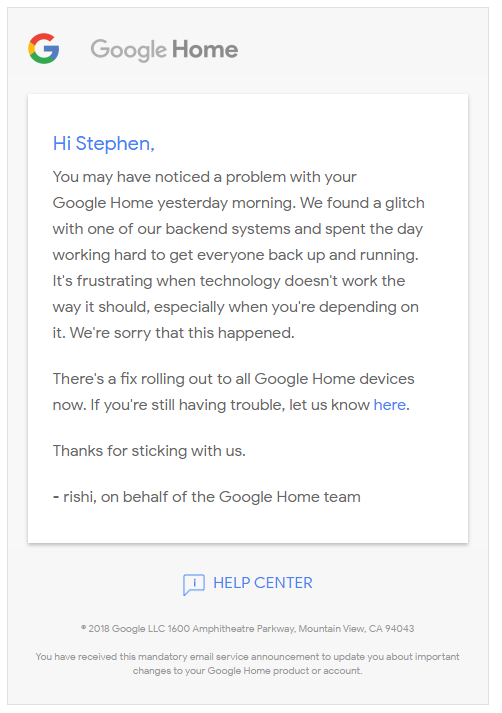 Following yesterday’s widespread Google Home outage, Google’s VP of Home products Rishi Chandra has sent an email to all Google Home customers apologizing for the incident. You may have noticed a problem with your Google Home yesterday morning. We found a glitch with one of our backend systems and spent the day working hard to get everyone back up and running. It’s frustrating when technology doesn’t work the way it should, especially when you’re depending on it. We’re sorry that this happened. There’s a fix rolling out to all Google Home devices now. If you’re still having trouble, let us know here. As Google’s hardware business grows and the Google Home encroaches on Amazon’s smart speaker turf, it’s reassuring and refreshing to see the company humbly apologize for its mistake.